Over at Mario Badescu Skin Care, our offices are filled with estheticians. Since we’re all skin care experts, we spend a lot of time talking about skin—our skin, your skin, our dog’s skin (just kidding! …sort of). We genuinely believe that good skin care can make a major difference in a person’s life. Nowhere is this more apparent than in the letters we receive from people who are experiencing clear skin for the first time in their lives thanks to their Mario products. We started wondering—why are there still so many people struggling with acne? What is the real obstacle that’s standing between people and their goals for clearer skin? Before I became an esthetician, I had a very hard time managing my acne. Sometime after I started working in the skin care industry it occurred to me that I was able to keep my skin clear fairly effortlessly. What had changed? I hadn’t gotten any less oily (that’s for sure) and I hadn’t gotten notably older. What was the secret behind my new clear skin? The answer to this question is simple: Knowledge. …if you know your enemies and know yourself, you can win a hundred battles without a single loss. If you only know yourself, but not your opponent, you may win or may lose. This saying really resonates with the struggle against acne. 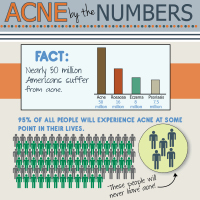 You must understand both acne and what you’re doing to your skin before you can beat this chronic condition. Our famous acne spot treatment uses salicylic acid and calamine to shrink whiteheads overnight. Our Buffering Lotion keeps cystic acne under control with its deep penetrating formula. Our Acne Facial Cleanser cleans deep and exfoliates your skin to control acne breakouts. Accurate and useful information on a very common skin problem specially among teenagers. I believe that the quality of food people eat everyday and the levels of stress on a person can also make a difference.